Dr. Gloria Kim grew up in Seoul, Korea before moving to sunny Southern California at age 9, not even knowing the alphabet. She learned quickly to adapt, but this experience also taught her at an early age that being different can still be positive. She learned about resilience and compassion, both acting as seeds that would blossom into her dream to become a physician. Dr. Kim graduated with highest honors from UC Berkeley with a BA in Molecular & Cell Biology and with a minor in Ethnic Studies. She returned to Southern California to pursue her MD at UCLA School of Medicine, where she found her passion to become a general internist. She continued on to finish her internship and residency at UCLA. 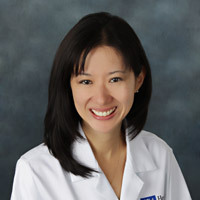 After completing her Internal Medicine training, Dr. Kim joined UCLA Internal Medicine Consultants of Santa Monica where she actively engaged in inpatient and outpatient care, nursing home care, as well as medical student and resident teaching. After 12 years of practicing in Santa Monica, she is thrilled to be joining the team at the UCLA Torrance Primary and Specialty Care office, and being part of the vibrant and diverse South Bay community. She enjoys connecting with patients and developing partnerships with patients. Her two greatest passions in life are medicine and family. When not working, you may catch her at sporting events or music lessons and recitals with her boys and husband. She enjoys cooking, baking, reading and spending time with her family.